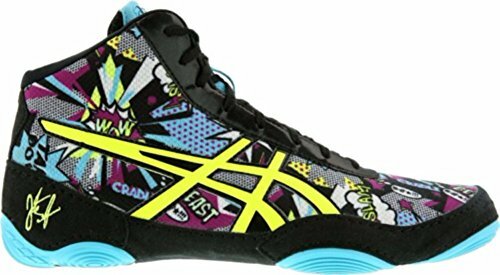 Based on the specifications of champion wrestler Jordan Burroughs, the ASICS® JB Elite™ V2.0 wrestling shoe is as dominating on the practice mat as it is during tournament play! Single-layer mesh upper offers breathability and flexibility. Lace-up closure features a Lace-Garage™ pocket that conceals laces and meets regulation for tournament competition. High collar for added ankle support. Comfortable mesh lining and a lightly cushioned footbed. Logo hits at lateral side and heel. Stitched Jordan Burroughs signature on outer heel. Split Sole design features "serradial" traction pods for maximum flexibility and grip. Imported. Measurements: Weight: 9 oz Product measurements were taken using size 12, width D - Medium. Please note that measurements may vary by size. Weight of footwear is based on a single item, not a pair. Comfortable mesh lining and a lightly cushioned footbed. Logo hits at lateral side and heel. Stitched Jordan Burroughs signature on outer heel. Split Sole design features "serradial" traction pods for maximum flexibility and grip. Imported. Measurements: Weight: 9 oz Product measurements were taken using size 12, width D - Medium. Please note that measurements may vary by size. Weight of footwear is based on a single item, not a pair.